← 397 "Crook and Ladder"
The family comes in and sits on the couch. A second family comes and also sits on the couch. Then multiple families come in, and the house overfills with them. "Stop, or My Dog Will Shoot!" is the 20th episode of the eighteenth season. "Homer is upset when he realizes that Marge brought him and the family to a boring Harvest Fest instead of his much-anticipated day of debauchery at October Fest. Attempting to leave, Homer accidentally drags the family into a puzzling cornfield maze. When the whole family manages to escape except for Homer, they send out Santa's Little Helper, who sniffs out Homer and rescues him. 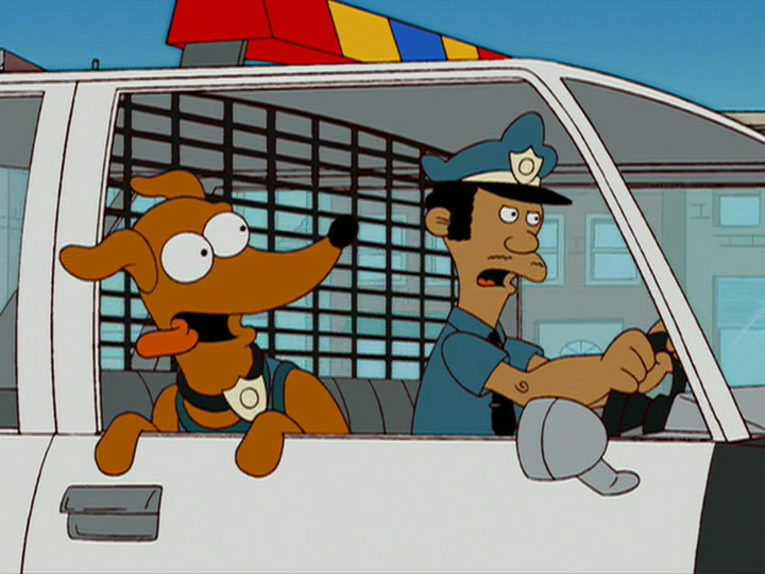 Santa's Little Helper becomes a local hero and the Simpsons decide to enroll him in Police Dog Academy, where he's teamed with a grizzled veteran cop named Lou and they become a crime-busting duo. Bart's excitement quickly dissipates when a jaded Santa's Little Helper bites him, and the Simpsons send the dog away to live with Chief Wiggum. To appease Bart's depression after the loss of his dog, Marge agrees to buy him a huge pet snake. But when the snake causes a life-threatening situation at Bart and Lisa's school, Santa's Little Helper gets a chance to redeem himself." Homer, excited about going to Oktoberfest, is disappointed when he discovers that Marge has tricked him and the kids into going to a Harvest Festival which allows no alcohol. While attempting to leave, Homer accidentally leads the family into a cornfield maze. Lisa crafts an escape plan with Tremaux's Algorithm, a real life maze-solving method, but Homer is left behind. Santa's Little Helper is called upon by Bart to find Homer. Santa's Little Helper manages to sniff out Homer and drag him out of the maze. Santa’s Little Helper becomes a hero and the Simpsons, persuaded by Chief Wiggum, enroll him in the Springfield Animal Police Academy, where he’s teamed with Lou. Santa's Little Helper catches Snake Jailbird who is taken to court, but freed on a technicality. This makes Santa's Little Helper jaded, and when he returns home, he bites Bart. The Simpsons send the dog away to live with Lou. As a replacement, Marge buys Bart a huge pet python, which he names "Strangles". Bart takes Strangles to show and tell at school, where Strangles escapes into a school lab and unintentionally knocks over chemicals, creating a toxic cloud. Bart collapses inside the building. Both Santa's Little Helper and Strangles arrive to save Bart, who chooses his faithful dog to save him. 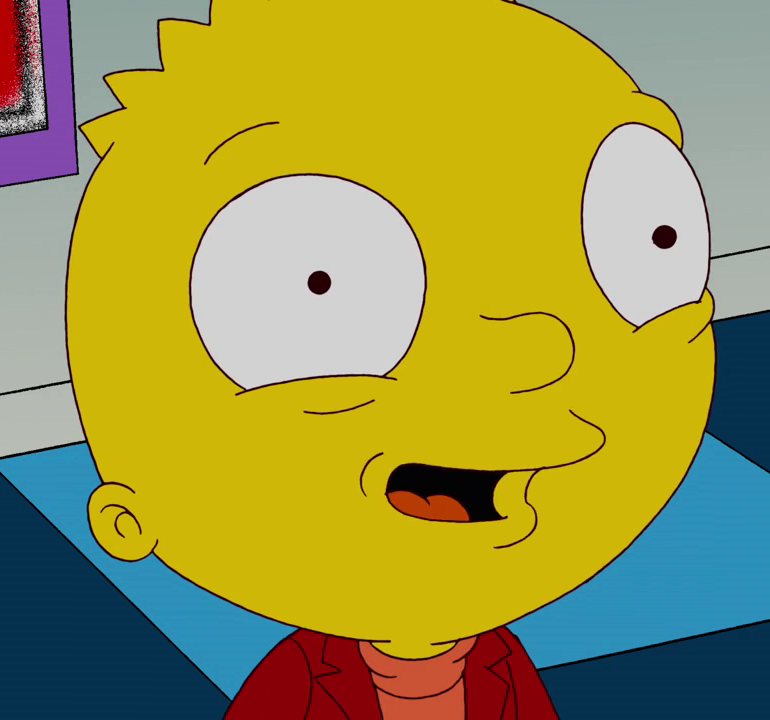 Santa's Little Helper goes back to living with the Simpsons. Strangles becomes adopted by Groundskeeper Willie, who places him in the fire hose coil. 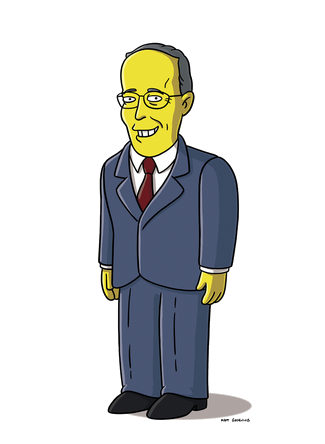 Rudy Giuliani was originally announced in the official press release as appearing in this episode. As a result, several images of him recording his part as well as a promotional image of him in Simpsonized form, were released. However, his appearance was not included in the final version of the episode. According to executive producer James L. Brooks in an interview with Charlie Rose, the show was not allowed to use Giuliani's appearance because he had become a presidential candidate. His appearance is present in the syndicated version of the episode and the version that aired on Sky One in the UK where he gives the commencement address at the police animal academy graduation ceremony. Giuliani's absence marks the second time during season eighteen that a guest was announced in the official press release but did not appear in the final episode. 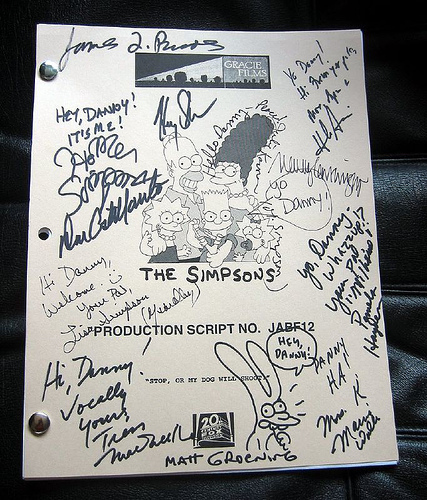 For the episode "Homerazzi", Harry Hamlin and Peter Wolf were announced as guest stars but neither appeared. ↑ Rose, Charlie (Host, Executive producer). (2007, July 30). Charlie Rose:A Conversation About The Simpsons Movie [Television production]. Charlie Rose, Inc.. Retrieved on 2007-07-31. Event occurs at approx. 28 minutes in. Modified on July 21, 2016, at 10:39.